EMPLOYMENT SITUATION FEB 2017: COULD THIS BE THE START OF SOMETHING BIG? In sifting through the EMPLOYMENT SITUATION - FEBRUARY 2017 several things pop out at you. First, you’ll notice that the Bureau of Labor Statistics points out that the payroll jobs number came in at a robust 235,000 for the month. Secondly, you will note the unemployment rate came in at 4.7 percent, dropping from 4.8 percent in January 2017. Total nonfarm payroll employment rose by 235,000 in February, and the unemployment rate was little changed at 4.7 percent, the U.S. Bureau of Labor Statistics reported today. 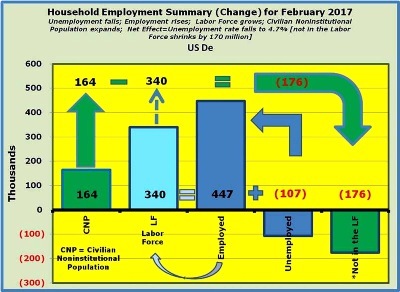 Employment gains occurred in construction, private educational services, manufacturing, health care, and mining. There’s no doubt that the February 2017 labor report was very positive. To key on one point in a overall very good month, let’s take a quick look at the Employment-Population Ratio. The Employment-Population Ratio is measures the employed divided by the Civilian Noninstitutional Population (those 16+ years of age who are not in the military or otherwise institutionalized). In coming in at 60.0%, this is the best reading since February 2009 (60.3%) --- a very long eight year period. 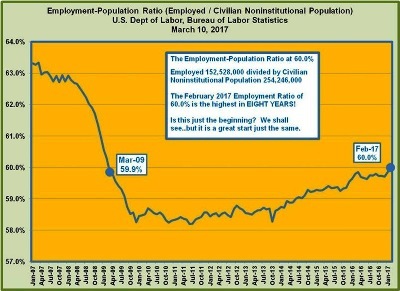 It’s important to note that the FED looks upon the Employment-Population Ratio as an important data point in formulating monetary policy. This is a very short piece, but we wanted to make sure you were aware that Federal Reserve [Federal Open Market Committee (FOMC)] will be meeting on March 14-15 (www.federalreserve.gov/monetarypolicy/fomccalendars.htm://). In all likelihood, the FOMC will vote to raise the targeted Fed Funds rate by 0.25% or even 0.50% (from the current 0.50-0.75% targeted range) based in part on the much improved Employment-Population Ratio. Having said this, there is much more critical analysis that we will present in the near future regarding the impending Fed Funds target rate hike. Employment-Population Ratio again rose to 60.0%…this is the highest number since February 2009 (60.3%)! Our apologies for extended time since our last article, but we will get more out for you shortly.